Last May, through the wonders of Google Books, I stumbled across Blumenstand, a collection of "nonscientific essays" self-published in 2007 by Frank Luger, a physician from Montreal. The collection includes an essay on Emperor Norton that, apparently, Luger had written many years earlier. One of the illustrations for the piece is this curiously — and tantalizingly — unsourced montage. This unsourced and uncredited photomontage illustrates "Norton I, Emperor of the United States," an essay included in Blumenstand, a collection of "nonscientific essays" self-published by Frank Luger in 2007. Source: Google Books. But what about the signature? Where did it come from? Is it genuine? By and large, the examples of the signature of the Emperor that are known are those that are attached to the surviving examples of his imperial scrip. Which — based on a survey of these examples — would seem to place the signature in question in the category of "One of these things in not like the other." Compare the "N" of "Norton" in the signature above — dated 19 June 1989 — with the one in the signature on the 10-dollar bond below, dated five months later. Of course, the discrepancy in penmanship is not sufficient, on its own, to disqualify the June 1879 signature. All of us have had the experience of the pen that trips over a rough spot in the paper — or of just "zoning out" for a second — with the result that we are "forced" to form our letters differently than we ordinarily would. Too: Much of the penmanship in the June 1879 sample does seem sympathetic with the latter. Notice the word "Emperor." Or how the "I" flows from "Norton." Or the shape of the "7." All very similar. The bigger conundrum in the June 1879 sample would seem to be the use of the phrase "Protector of Mexico" in the signature. 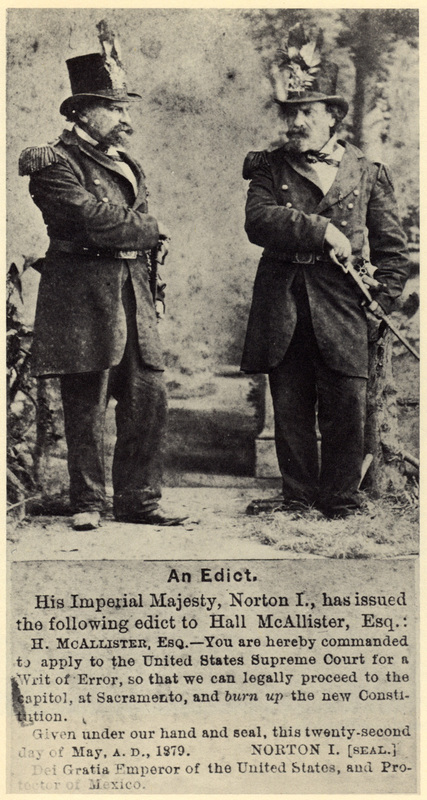 Emperor Norton had adopted the moniker in the fall of 1861, when Napoleon III — nephew of the more-famous Napoleon — invaded Mexico on the pretense of collecting a debt. But, a few years later — during the monarchy of Maximilian I of Mexico — the Emperor had dropped the title, reportedly lamenting that it was "impossible to protect such an unsettled nation." Later, in the 1870s, he seems to have picked it back up again, sporadically referring to himself as "Protector of Mexico" in the texts of his Proclamations — but only very rarely using the title in his signature, usually preferring to sign off simply as "Norton I." So, why would a handwritten signature of Emperor Norton's in June 1879 have included the honorific? One clue may lie in the source of the signature. When I wrote to Frank Luger last May to ask about his photomontage that included the signature, he responded: "Unfortunately, the article was written so many years ago that the source material is no longer available; and in fact, I have forgotten almost all about it. " Happily, the source material is available. Several weeks ago, I was thumbing through the Emperor Norton photo archive at the California Historical Society, and — lo and behold — I saw something that looked familiar. Cabinet card of Emperor Norton (front), Imperial Gallery, San Francisco. Collection of the California Historical Society. Photo: John Lumea. Cabinet card of Emperor Norton (back), Imperial Gallery, San Francisco. Collection of the California Historical Society. Photo: John Lumea. What you're looking at here is a souvenir cabinet card from the Imperial Gallery, on Market Street in San Francisco. According to the markings on the back of the card, bottom right, the card was donated to the California Historical Society in April 1895. Clearly, cropped details of earlier photographs of the card are what was used to create the montage that accompanies Fred Luger's essay. As I noted above, the Campaign had been aware of the image on the front of the card — but not that a cabinet card, with a photograph of the Emperor and a newspaper clipping separately mounted on the card, was the source of the image. A quick Google Image search suggests that this also would be news to others who are aware of the image. Every place where the image has appeared online — including here on the Campaign's Web site — the same version of the image is used. It's a black-and-white version included as part of a gallery of photographs of Emperor Norton that appears in the book The Forgotten Characters of Old San Francisco, published in 1939 by The Ward Ritchie Press. The book sources the image to the California Historical Society, and the distinguishing smudge along the left side of the "edict" marks it as a photograph of the same card that I saw and photographed (in color, above). The crucial difference is that the Ward Ritchie book crops out everything — including the name and address of the photographic studio — that marks the image as part of a larger artifact. So it is that sources that hazard a guess as to the origin of the image tend to guess wrongly that the whole thing — Emperor and edict — was a single newspaper clipping. In the clipping that is part of the card, the signature of the Edict attributed to Emperor Norton is prefaced with the words "Given under our hand and seal, this twenty-second day of May, A.D. 1879" — a construction that he used many times. Notwithstanding both this and the inclusion of the bracketed word "[SEAL]" — presumably intended to assure readers that there was a corresponding piece of paper from the Emperor, with his actual seal affixed — the use of the title "Protector of Mexico" does leave open questions as to the authenticity of the edict. Certainly, inasmuch as Emperor Norton and his legend long had been used as a sales hook — including for cabinet cards like this one — it's not surprising that "Protector of Mexico" persisted in the imaginations (and senses of humor) of newspaper editors and commercial photographers for years after the Emperor himself stopped regularly using the title. But the "authorship" of this card by the Imperial Gallery may provide a more specific clue as to why a newsletter clipping that preserved the "Protector" association was used to complement the photograph of the Emperor. It is likely that Hector William Vaughan died around 1878, since by then his wife Emma was listed as the proprietor of the Imperial Gallery at 724½ Market. It seems reasonable to guess that Vaughan — who had worked as a photographer in Mexico, and whose studio had made portraits of at least one hero of the Mexican resistance to Napoleon III — might have had a soft spot for anyone declaring himself "Protector of Mexico," and that this might be why the clipping identifying Emperor Norton in this way is used on the Imperial Gallery card. Alas, the "Edict" mounted to the front of the card and dated 22 May 1879 is not sourced. And the mirrored photograph is not dated. But the more aged appearance of the Emperor is consistent with photographs of him that have been dated 1878 — so it's conceivable that the photo mounted on the Imperial Gallery card was taken by Vaughan himself. What we can see is that this cabinet card was blank on the back. Vaughan's shop on Market Street was just south of Kearny Street. This was but a block or two from where Emperor Norton regularly could be found making his way to the Mechanics' Institute, on Post between Montgomery and Kearny, or making his late-afternoon promenade along Montgomery. Indeed, the Emperor's own imperial residence was but a half-dozen blocks to the north of the Imperial Gallery storefront — on Commercial between Montgomery and Kearny. The Emperor always was generous and accommodating to his subjects and fans. Perhaps one of these bought the card in Vaughan's shop, then spotted the Emperor nearby and asked for an autograph. Perhaps the Emperor was willing to oblige in exchange for a tribute of 50 cents or a dollar to the Empire. Perhaps the Emperor knew (of) Hector William Vaughan and his associations with Mexico. Perhaps he noted his own old still-fondly-held title on the front of the card. Perhaps the autograph seeker made a special request that he sign as the "Protector of Mexico." Perhaps any number of these was enough to inspire Emperor Norton to sign the card that way.